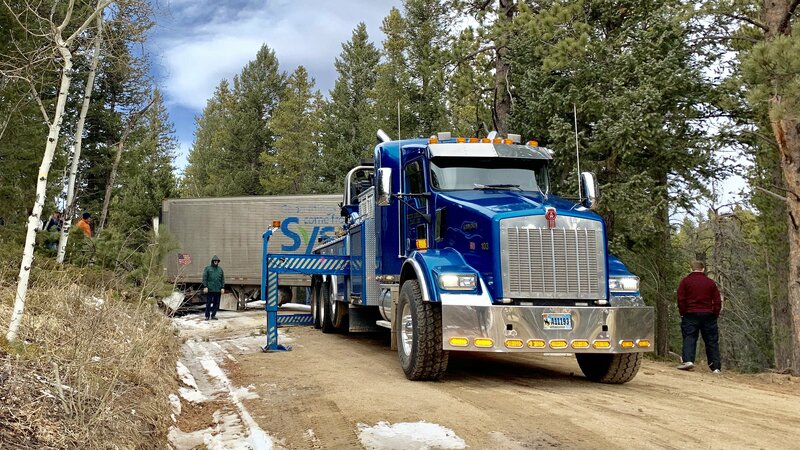 Sisco Delivery Truck Jackknifes GVR Access Road. Ministerial Retreat Participants Delay Return Home » It was snowing on Sunday evening, January 6, as expected in the Glacier View Ranch area. But this did not effect the opening of an annual RMC ministerial retreat. Departures from the retreat were a different story. A Sisco delivery truck jackknifed just a few hundred yards from the lodge on a slippery iced access road. “This is a news story, are you going to put it in the NewsNuggets?” asked Ted Williams, a Fort Lupton church pastor. 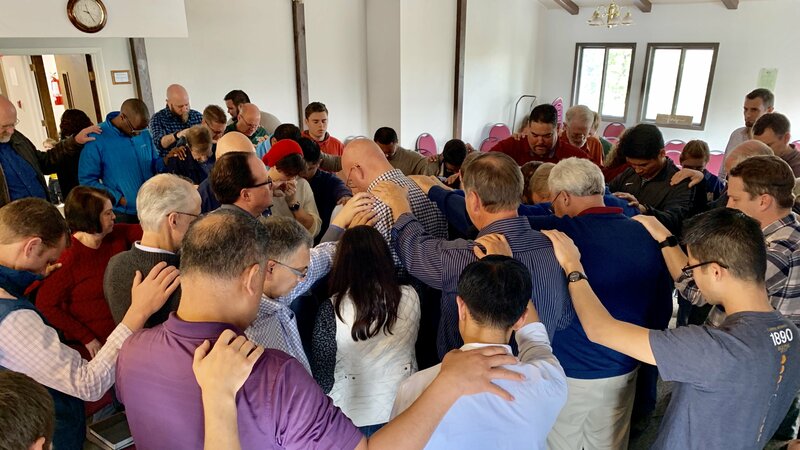 Humor abounded with several pastors laughing that it must have been a ploy by Mickey Mallory, RMC ministerial director, who organized the retreat. “He wanted us to stay to the end and not consider leaving early,” Ed Barnett, RMC president remarked. Some 60 ministers, representing all churches in the Conference, enjoyed the four-day annual conference, and small obstacles did not dampen their enthusiasm. "Lifting Jesus Up" was this year’s theme and included presentations by special guests, well-known revivalist Lee Venden, and Dr. Chris Holland from Adventist World Radio. “I have found myself come alive,” Bob Alpine, pastor of Alamosa and Monte Vista churches, said of the retreat. Venden, who conducts revival seminars in the United States and abroad, challenged the ministerial group to make Jesus the main thing in everything that we do, including our preaching and teaching. “When we lift Jesus up, He will not only move our hearts, but also the hearts of those around us," he said. Chris Holland’s presentations linked the theme with evangelism. He said that the United States should be considered a mission field just as much as places overseas. He challenged us to make our churches centers of influence in the community. Commenting on his presentations, Leif Hansen from Estes Park said “I was so inspired and re-energized by being reminded of this great truth that was woven like a red thread throughout Dr. Chris Holland's seminar, evangelism is not what we do; evangelism is who we are!" “I’ve appreciated the time with fellow pastors at this retreat. The guest speakers have provided valuable information that is helpful in ministry and it’s so nice to do all of this up in the mountains at GVR. There is something special about spending time in nature and hearing encouraging messages. I’m thankful for my time here this week,” commented Jamey Houghton, Franktown church pastor. 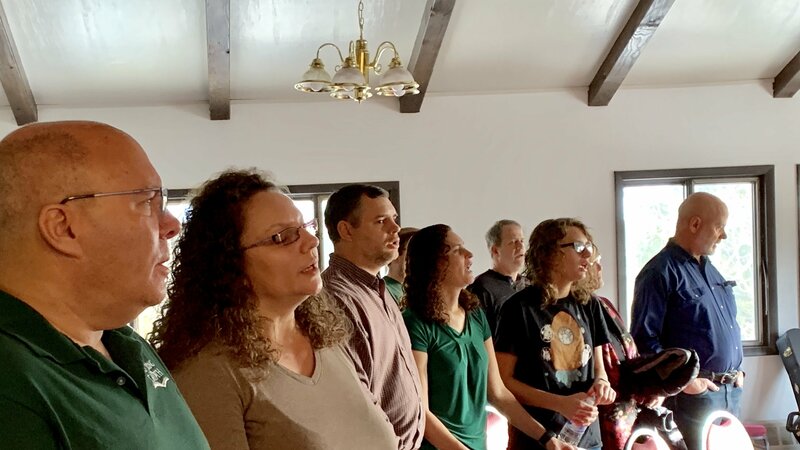 During the retreat, it was announced that the association of Rocky Mountain Ministerial Spouses, formerly known as Shepherdess International was formed by several pastor’s spouses who attended the retreat. Emily Roque-Cisneros was elected as RMMS president with Heidi Martin, VP, and Sherva Wilson and Esther Marpaung, assistants and Grace Logan as Care Coordinator. Besides planning activities for ministerial retreats, a Facebook page will be created to allow spouses the chance to stay connected and informed of any relevant happenings. “It was a very inspiring and uplifting meeting,” said Gingerlai Tupito from Arvada First church. “We got to do a lot of sharing and interacting. 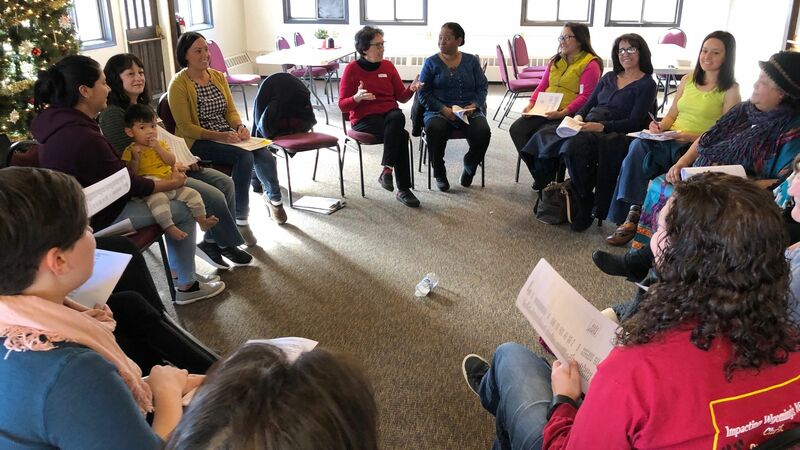 We were reminded how to be effective assisting our spouses’ ministry and how we can relate to our fellow church members in a loving and caring way,” she said. “God never fails to encourage, inspire and bless us during our RMC pastors fellowship and worship together. I am looking forward to the blessings He will bring as we share the joy of serving Him with our church families,” said Steve Nelson, a district pastor in Western Wyoming. The new students were greeted warmly by mentor students at Campion. The mentor students help new international students make friends and integrate into our campus culture by walking with them to classes, eating meals with them, and participating in activities with them during the first few weeks of arrival. In addition to the new students, a college-age volunteer from Brazil has also joined the staff at Campion for this semester. 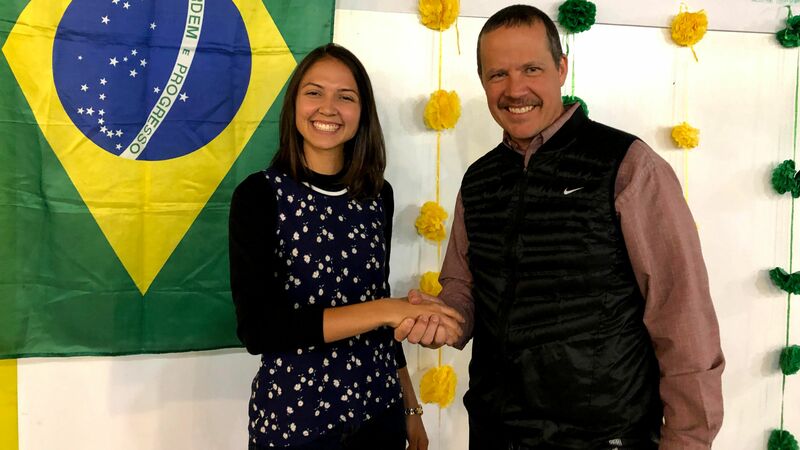 Erika Faria is a senior college student at the Universidade Federal do Rio de Janeiro where she studies Music Education. Here at Campion, she will be assisting in the Music Department, the ELL classes, and in the girls' dorm. “I needed an experience to improve my English and I chose Campion Academy because I saw an opportunity to improve my English and work with music in a Christian environment,” she explained. 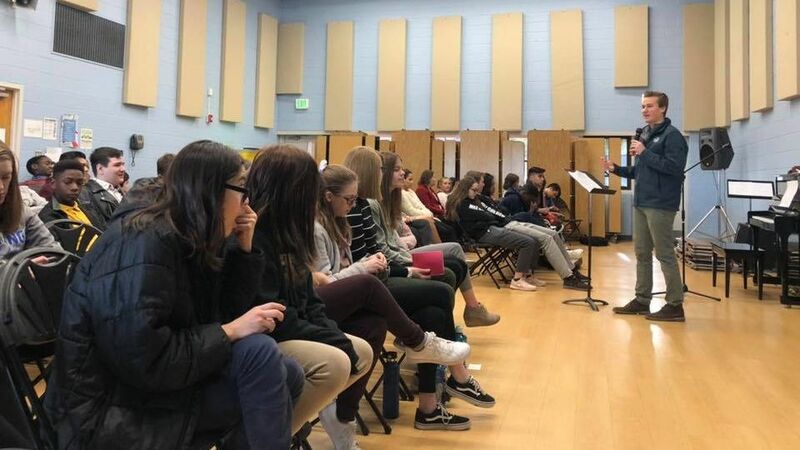 Upper Schoolers Mentor 8th Graders » Upper school students hosted the eighth graders this week, an annual tradition called “8th Grade Move-up Day”. It’s a chance for our own eighth graders to experience a day in the life of an upper school student. Eighth graders get to spend time with the teachers they will have next year, sit in the classrooms that will become second homes, and most of all, collaborate with the 9th and 10th grade students that at one time were their middle-school peers. Students participated in games and hands-on activities as they rotated through classes that showed off all that they will be doing next year. Of course, it’s not all fun and games in high school. 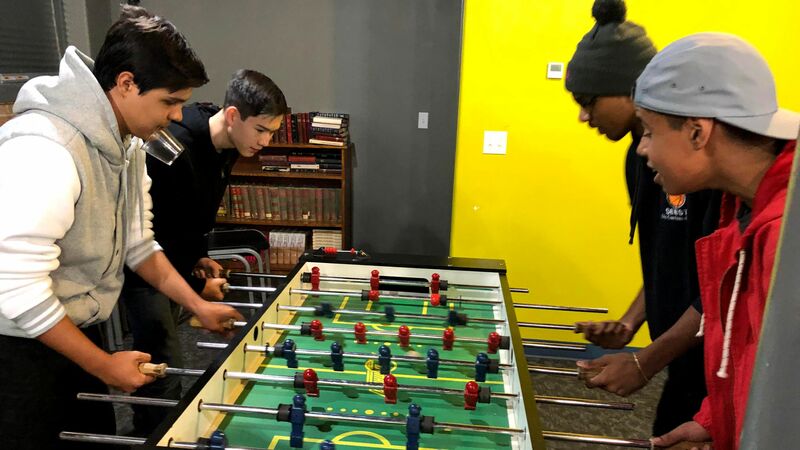 Broken into teams of eighth graders and upper schoolers, the teams had to meet intense challenges. The day also included a chapel program, hosted by Kiefer and Jessyka Dooley, and of course, donuts. La Vida Mission Academy » "The teachers here are awesome," proclaimed Aridawnn, a first-year student at La Vida Mission Academy, RMC's self-supporting school serving the Navajo people in New Mexico. Day students are accepted at no charge and the school currently boasts 17 students with teachers certified in New Mexico and with curriculum driven by requirements of the Education Department for the State of New Mexico. The school year began with a Pathfinder campout at Blue Water Lake where students braved the rain and either got acquainted or re-acquainted. Many other trips and activities followed. Ninth-graders study algebra, physical science, English, reading, Bible, Navajo language, Navajo history, and New Mexico history. Senior studies prepare them for their general education diploma (GED) which provides them with data support for their diplomas and college opportunities. Seniors are looking forward to their senior trip during which they will visit a Seventh-day Adventist college, experience a traveling classroom and give presentations along the way at various churches. elementary school so I have family here. I really like how everyone cares about us." Warren (a graduating senior) shared, "I will be graduating this year and want to become either an underwater welder or Adventist pastor. 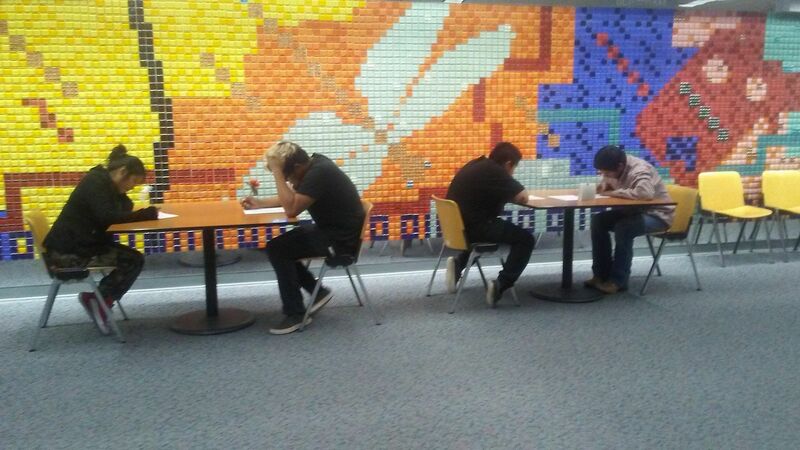 I have passed two of my GED tests to support my high school diploma. I play the guitar and really appreciate the chord book Ms. Dorie gave me." that La Sierra Academy built for us. We have welding and auto mechanics. One of my favorite things is tanks. I was able to learn how to build a toy one during welding class." you get to know them. What’s fun are the outdoor activities like the camping trip we went on at the beginning of the school year. There is mechanics, Pathfinders, academy groups who come and help us, art class for the elementary and once a year we get a semi truck full of donations. Our dorm parents are caring and cook us some great food." La Vida School has an academic wish list that includes an interactive white board with ceiling-mounted projector, science equipment for physical science, biology, and chemistry, and textbooks for subject content in core subjects. To contact the academy, call 505-786-5539. They're located at 700 County Road 7730, Crownpoint NM 87313. Jessyka Dooley is the new Youth Ministries Assistant Director as of January 1, 2019. She is the new bride of Kiefer Dooley and comes to us from the Boulder Church where she served as Associate Pastor for the last two years. Her ministry concentrated on various areas within the church with a special interest in youth and kids ministries. Pastor Stephen L Schwarz officially retired December 31. Pastor Bradford Schleif also officially retired December 31. Pastor Charles Gadway transferred to the Ohio Conference effective Decmeber 31. Sherry Muller, Planned Giving & Trust Services accountant officially retired December 31. Memorial Service at Brighton Church » A memorial service for Dr. Leiland Kaiser will e held at 2:30 p.m., Sabbath, January 12 at the Brighton Church. Leiland passed away January 3. All are invited to celebrate his life. The church is at 567 E Bromley Lane, Brighton. 10 Days of Prayer » 10 Days of Prayer began January 9. Be blessed as you join in the 10 days in your local church, or join in the nightly RMC conference call! Can't come every night? No worries! All of the resources are available to everyone at www.tendaysofprayer.org! How: Call 605-468-8026 and use access code 1010801# You can pray along or just listen in! Please forward this email - let's blanket RMC and beyond with an invitation to prayer! Be blessed, friend, and let's pray! Another Prayer Conference Opportunity » In addition to our weekly RMC prayer call that takes place at 6:30 a.m. Wednesdays, you are welcome to join another prayer call at 8:30 a.m. Sundays with Tammy Romero, prayer ministry leader at True Life Community Church. To join, call 669-900-6833 and key in the pin 541451286#. "Feel free to just listen or to join in praying," invites Romero, "and let's come before the throne."